Are you interested in getting dental veneers but feel like you need to learn a bit more first? We can help! Are you feeling frustrated with the look of your smile? Are imperfections all you see when you look in the mirror? If you’ve said “yes”, then it might be time to talk to one of our Lawrenceville, GA, cosmetic dentists about dental veneers. Not sure what dental veneers are? Don’t worry; we’re here to explain. Ever wished there was something that you could place over your teeth to improve how they look? Well, your wish has been granted. 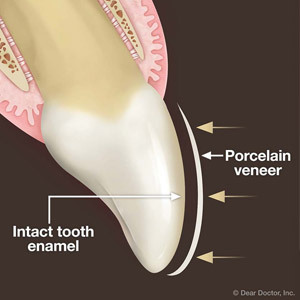 Dental veneers are made from a tooth-colored material (often porcelain) that is bonded to the front of your teeth to hide a myriad of imperfections. Hate those stains caused by trauma to your tooth or smoking for years? If teeth whitening isn’t cutting it, then it might be time to talk to our Lawrenceville dentists about getting veneers to instantly brighten your smile. Even though cracks and chips may not affect how your teeth function, they certainly can put quite the damper on how your smile looks. Don’t worry; veneers can also hide these issues, as well as improve the shape of your teeth. Whether teeth grinding has worn down enamel or some teeth just aren’t the same length as the rest, veneers can even out your smile so that teeth are all the same shape and size. Do you hate that your front teeth overlap one another? Have one tooth that is just a little bit crooked? You may assume that you’d have to wear braces in order to get the results you want, but if you don’t want to wait months to fix these problems, let dental veneers tackle it. Veneers can easily cover gaps between teeth, as well as offer a straighter smile for more minor misalignments. Of course, before getting veneers it’s important to know that there is some tooth preparation required if you choose traditional veneers. Even though veneers are thin, we will still need to shave off some enamel from the front of your teeth so that veneers don’t look bulky or awkward when applied. While this preparation is minimal and doesn’t hurt, it’s important to note that enamel doesn’t grow back. Once enamel has been removed, your new restorations are for life. Let the Center for Cosmetic and Sedation Dentistry in Lawrenceville, GA, provide you with the dental care your smile needs to look its best. If you want to know if your teeth could benefit from dental veneers, give us a call today.